Championship Day : Sunday, December 16th. Ray Irvine and Laureen Smith both continued their stellar seasons with determined wins in the Men’s and Ladies Singles Championships. A very appreciative spectator audience saw Ray claw his way to a win over defending champ Gary Sanders (26/19), and Laureen’s steady consistency wearing down Robyn Moore (25/17). Congratulations to both very worthy winners. 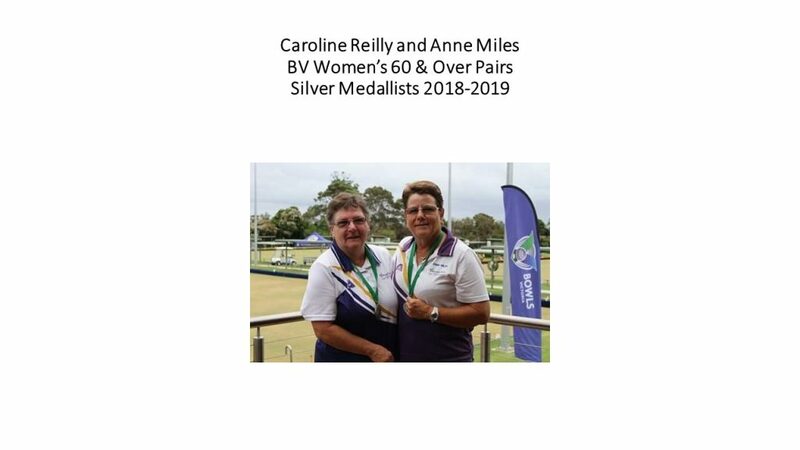 Our girls, Anne Miles and Carolyn Reilly, have represented Ovens and Murray Region at the State Ladies Over 60’s Finals. The event was held at Frankston last week, and even with two days of heavy rain, they were able to come home with silver medals around their necks. A great achievement, especially under the conditions. Anne also had a successful Test series in Tasmania, and has been selected again for Victoria in the upcoming Test against NSW. Continued success, Anne! We hope Victoria can do it again. Pennant will now take a few weeks break over Christmas and New Year, but if you are after a roll or practice for Pennant, there will be rinks available. Merry Christmas, and a happy and safe New Year to all.